This exercise consist of 6 objective questions. 3. Figure above shows a strip of ticker tape that has been pulled by a moving trolley. The ticker tape timer was vibrating at 50Hz. Find the average velocity of the trolley. 4. The ticker-tape in Figure above was produced by a toy car moving down a tilted runway. If the ticker-tape timer produced 50 dots per second, find the acceleration of the toy car. 5. A trolley is pushed up a slope. Diagram above shows ticker tape chart that show the movement of the trolley. 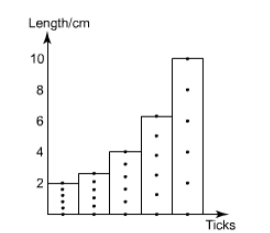 Every section of the tape contains 5 ticks. 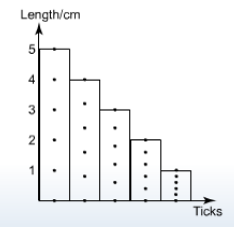 If the ticker-tape timer produced 50 dots per second, determine the acceleration of the trolley. 6. 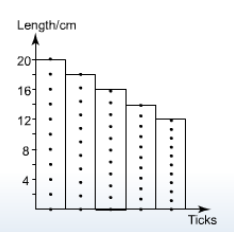 Figure 2 shows a ticker tape chart for the motion of a trolley. The ticker tape timer was connected to a 50 Hz power supply. Which of the following statements is true about the motion of the trolley? The initial velocity of the trolley is 100 cms-1. The average velocity of the trolley is 80 cms-1. The trolley moved at a uniform deceleration. The velocity of the trolley decreased at the rate of 10 cms-2 per second.